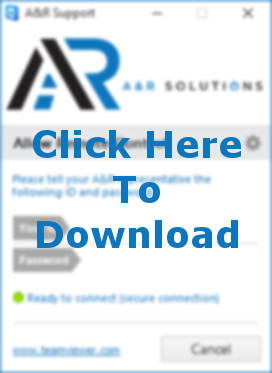 Click on the image below to start the download of A&R Solution's remote support tool; follow the instructions below to start your session. Choose either Run or Open to start the session; if neither of these options are available choose Save and then run the executable AnR_TeamViewer.exe. The download will appear at the bottom of your browser, click it to start the session. The download will appear in the upper right hand corner of the browser, click to open Downloads, click on the download to start the session. Click here to download TeamViewer for Mac & Linux.